Wherever new ideas surface to bring Industry 4.0 to life, the simulation of these ideas to test, develop, and demonstrate them is the logical next step. Ian McGregor | Emulate3D Inc. The fourth industrial revolution brings together advanced manufacturing, the internet of things, and the power of cloud computing to create more responsive manufacturing and delivery systems. The arrival of the internet has brought with it manifold changes in the way we live and the levels of service and quality we have come to expect, and Industry 4.0 describes a system capable of supporting and developing this further. Emulate3D simulation and emulation products are used at every stage of the design and implementation of manufacturing facilities and distribution centers, where the cost of decisions must be weighed carefully against the benefits. Analytical simulation techniques form the experimental backbone around which a flexible manufacturing system design is created – buffer dimensioning, resource definitions, equipment choices, product throughputs, and system responsiveness, can all be quantified with appropriate simulations. The implications of decentralised decision making in automated systems can be exhaustively studied and evaluated within the safe environment of a simulation model, without consequences should it fail, before being implemented in the real world. Only by testing control algorithms through simulation will the necessary level of confidence to release them into industry be achieved. A rigorous simulation approach allows the numerical justification of decisions, and minimises the investment risk. Once the physical layout of a system is defined and the likely flow of parts and products through it is agreed, then the control system can be fully developed and tested, before going on site. The virtual commissioning of controls is essential for guaranteeing the correct operation of the real system, but it also highlights the gains to be made in terms of saving time and reducing costs when project phases can be reliably virtualized and taken off the project’s critical path. Presenting the results of simulations and demonstrating the operation of control systems under different conditions can be done in various ways including Virtual Reality (VR) and Augmented Reality (AR). Emulate3D models can be viewed using the immersive HTC Vive or Oculus Rift headsets by several participants simultaneously, who may even be in different countries, over the internet. 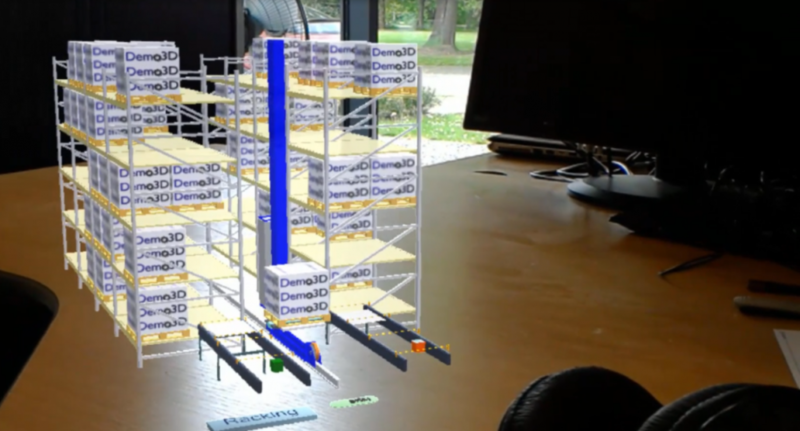 The Microsoft Hololens also enables multiple participants to view the same running 3D model overlaid on reality and discuss recent advancements and next steps, for example. Connected Manufacturing is a natural result of the Internet of Things (IoT) – if you started with a blank canvas and the current infrastructure, it’s how you might expect the system to react. Moving from a less connected but operational group of systems to the fully connected model will not be straightforward, and it is likely there will be complications along the way, all of which promotes the use of simulation at each stage as a means of understanding the implications and costs of change. When an item is ordered online, not only does the order trigger a delivery, but it could also create a cascade of automatic events that bring sales data together to calculate future demand for the item, and therefore how many replacements should be created and delivered, and if so, how and where. The propagation of decisions involving data from many different sources offers considerable opportunity for efficiencies in terms of sourcing, delivery, and manufacturing, but the systems implementing this need to be stress-tested by simulation in order to fully understand their response to all inputs before going live. Each step in the advancement of technology has involved changes in the way people live, the way they work, and the way they interact with each other. Each step resulted in requirements for new skills and different jobs, accompanied by a more educated and less manual workforce. Industry 4.0 will be no different in this respect, but the changes may come faster than those in previous transitions, creating opportunities for some and challenges for others. Simulations are data-driven, and the usefulness of any simulation model is constrained mainly by the quality of the data that drives it. The advent of Industry 4.0 and the enhanced level of connectivity that the IoT and greater sensor use brings will allow the creation and beneficial use of better models. Cloud computing provides the headroom necessary for the storage of the data but also the computing power necessary to generate results from ever-larger models running multiple complex experiments. The growing challenge is to build robust and reliable simulation models, understand their limits and what conclusions can be drawn from their results, as well as being able to present and explain them to project stakeholders. Wherever new ideas surface to bring Industry 4.0 to life, the simulation of these ideas to test, develop, and demonstrate them is the logical next step, and Emulate3D technology provides the complete simulation and emulation solutions necessary to achieve this. Ian McGregor is a co-founder of Emulate3D and has been one of the three Director-owners since the company's creation in 2005. Emulate3D develops a range of engineering software designed to assist with off-line virtual commissioning (Emulate3D Controls Testing), data-driven throughput simulation and analysis (Sim3D), and demonstration, prototyping and layout software, (Demo3D and Layout3D). In 2014 Emulate3D was awarded a Queen's Award for Enterprise in the Innovation category, for which Ian was presented to Her Majesty the Queen Elizabeth II. Emulate3D was named a "Cool Vendor" in Supply Chain in 2016 by Gartner. Prior to creating Emulate3D Ian worked extensively with various simulation products worldwide; living and working as an engineer in the US for four years, Japan for one year, Singapore for eighteen months, and France for ten years. He has a Bachelor of Science degree in Mechanical, Aeronautical, and Production Engineering, a Diplome d'Ingenieur in Applied Computing, a Master of Science degree in Computer Integrated Manufacturing, and is a Chartered Member of the Institute of Mechanical Engineers.